I am a very lucky person to have so many great hobbies, but one of my greatest passions, one that has lived longer and surpasses even my love for our caprine companions, is computers and technology. My dear grandfather is the source of this – as an architect, he had access to home computers very early on in their life, and as he adored me as all good grandfathers do, he shared this with me. Nevermind I was little more than a bouncing baby! Almost before I could read, I knew how to switch on the computers and navigate MS-DOS (Windows was a thing of the future in these times) via keyboard (the mouse too came later!) to the simple games and programs a young girl might enjoy. Even better, I knew the appropriate way to shut the computer down – much more complicated than it is now! I’ll never forget the first day we logged into the World Wide Web. I barely understood how it worked – and I had no idea how it would shape the rest of not just my life, but the world itself. My grandfather passed on fairly young, but the love of technology stayed and only grew. As my life changed and computers were much too expensive for me, I learned how to rescue parts and pieces from others and build my own. When personal websites became available, I taught myself HTML. I remember typing classes in Elementary and advanced networking classes in High School. For many years, I funded our farming venture by building websites for others – until WYSIWYG builders put me out of business! I continue to seek out new things to learn in the industry however, as I’ve always really enjoyed the straight forward challenges of writing code. And too my interests have expanded to include many other aspects of our new world, all of which tie back into my beloved desktop computer. So – obviously – I’ve managed to build a miniature “social empire” surrounding K-N-S Farm. Following links, one can find my website, my Facebook, my Twitter, my Youtube, my blog, my Reddit, and a few other less attended to social media platforms. My logo is recognizable at a glance, and the content I put out consistent – or at least I hope it is. Logo: Your logo is so important! This is what you should use on anything that comes from your farm/operation. From website header, to Facebook avatar, to Forum signature. Keep it simple – it’ll be easier to add it to anything, and you never know what you might want to put it on someday. Pay or create something original for yourself – avoid using clip-art spliced together or pre-made logos if you can. Often times farms start with these, and they often work well enough, but as you grow, remember, you’re also growing your brand recognition. It’s worth the investment. Website: In this current time, there are a good number of operations that believe websites redundant, and prefer to use other social media platforms exclusively. I say they’re wrong. A website is an incredibly valuable resource for your customers – all of the information they need should be there. A customer should be able to view your stock/product, and contact information should be available to them as well. Keep in mind when building your website – it’s for the consumer! One may love sparkles and music, but when someone goes to your page and encounters lag from particle effects and auto-playing music, they’re going to close your page. Facebook: There are many social media platforms now, places where one can connect to others, be they local or distant, but there is no denying that Facebook is still the current king. There are an uncountable number of resources for goat and other stock breeders and keepers, from sale groups to pages about color patterns. Just about every farm I know these days utilizes a Facebook page – myself included. I always recommend to have one, and to ensure a link is easily available on your website. Don’t forget to share the page on your personal page! Other Social Media: First and foremost – don’t take on more than you can keep regular, but don’t forget to check out other social media platforms. The Internet moves at breakneck speed and it waits for no one. You just never know what the next platform to explode will be! If you have a special or favored hobby/skill that falls in line with one of these, absolutely use it to its best advantage. Love to take a lot of pictures? Instagram is great for that. Do you have a talent for videography and editing? Youtube offers a ton of possibilities. Even if you don’t have the time to dedicate now, it’s often prudent to sign up to these services and set up a profile that links back to your mainstay location. There’s more to it than just setting up and posting, of course. It’s incredibly important to treat your farm’s business pages as exactly that. Remember that you are posting to potential, past, and present customers and consumers. Your page, website, etc, are no place for political, personal issues, and religious postings. Now, I know many farms are founded on religious ideals, and perhaps there are farms founded on political ones as well. Your pages are like your farm in the end – yours. Post as you will, but when it comes to drawing in a large – and varied – fanbase, you must be aware of the image you are presenting. How you handle an issue that arises will change how others perceive you and your farm as well. It’s difficult to give guidelines in these cases because they vary so wildly, and each farm will handle problems that arise differently. The rule of thumb to remember is to remain calm, collected, and never allow yourself to become heated publically. Whenever possible, move issues with customers into a private method of communication. Finally, you’re never going to please everyone. You’re never going to make everyone happy, and no doubt you’ll face some type of online harassment, abuse, or negativity. This is just part and parcel on the Internet. The keyboard and screen gives some the courage to be ugly, and there’s absolutely no point in responding to it. Block, ban, and move on. Occasionally there may be instances in which it’s prudent to respond, but for the most part, there is nothing to be gained from it. We are so fortunate to live in this age of fast paced communication and education. I remember clearly the days of scanning the newspaper ads, or putting ads in them ourselves to sell stock. The bulletin board at the local feedstore was the original Facebook local sales group. You played phone tag with a stranger, then wrote down directions and hoped they were correct! The flea markets were the hot places to be when looking for a varied selection. Now it’s easier than ever to get what we’re looking for, and so many ways to utilize it. Break free of your Internet comfort zone and expand! I raise Nigerian Dwarf goats in my personal herd, and I am also the stock manager at a dairy that produces cheese for commercial sale. I am responsible for the care of almost 200 goats, everything from their conception to their death, and I love it. I also am passionate about sharing my love and knowledge of the caprine species with everyone who has a desire to share their lives with them as well. Goats are challenging animals, with little official research and a difficult learning curve. It's our responsibility to band together and share information as we learn it. 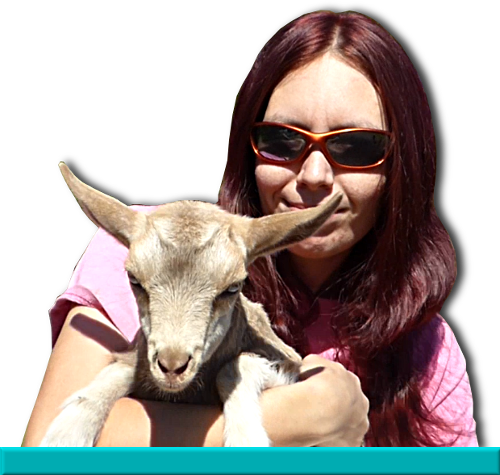 Here on this blog I share my experiences, adventures, and failures in the goat world. I don't shy away from any aspect - this includes birthing, breeding, and death. I hope you enjoy my posts, and please feel visit our website. Don't miss out on our Facebook and Youtube as well, linked below. You can support our farm and us as a content creator by following us on social media! Visit our Facebook page, follow us on Instagram, or subscribe to our Youtube! You can also choose to donate directly through Paypal by clicking below. We absolutely appreciate your support, in every form! We do what we do for you. Copyright ©K-N-S Farm All Rights Reserved.